Around the world, gold is seen as one of the most valuable, versatile, and desirable materials. Gold has been valued as a material of high worth and equally high importance as far back as the ancient Egyptian times. Just as ancient is the idea of borrowing against the value of gold. Families often store their wealth in gold, and many people prefer gold to the fluctuation of paper currencies. In times when cash is needed, instead of trading off gold or selling it, a gold loan can be ideal to secure the funds needed. A gold loan is generally a short-term loan where money is borrowed against the value of stored gold. If you have a specified amount of gold in a secure facility operated by a financial institution, then you can borrow against the value of that gold. The transaction is very straightforward, especially if the gold is stored in the right location. As an example, you have $200,000 worth of gold. However, you might need access to $100,000 in cash right away. While you go through the challenges of moving and selling your gold, that also means your reserves will be depleted. Instead, you can take out a gold loan. You can borrow that $100,000 as long as your gold is being stored and monitored by the lending agency. In this way, the gold is like a form of collateral for the loan. Once you repay the loan in full, you will regain full possession of your stored gold. This concept is not a new idea. In centuries past, families might take out a gold loan against the value of a necklace or a collection of gold coins. This is essentially the same practice, but on a larger and far more secure scale. Gold loan programs offer you the opportunity not only to have a safe investment, but the opportunity to diversify your assets. Some individuals see gold as a safety net in case a currency fails. Others view it as a secure and valuable asset to leave for their loved ones after they’re gone. Still others enjoy it as another option for asset diversification. Gold isn’t a readily liquid asset and you might be presented with a great investment opportunity you need to move quickly on or you want to take advantage of a sudden dip in currency exchange rates. At some point in time, many of us need to fund the educational aspirations of our children or pay for those unexpected personal or medical situations that arise over the course of our lifetimes. These are the types of circumstances when participating in a gold loan program is very advantageous. Liquidating gold takes too long, but a gold loan provides you with a secured line of credit to pay for personal or medical needs or invest in great opportunities to diversify your financial portfolio. As far as a former currency, metal, and store of value, gold is the gold standard so to speak. It has long held an intrinsic value by many and been relied on when other currencies fail. While you can obtain secured loans against many items of value, gold stands out as a particularly appealing choice. Gold is a stable material and doesn’t depreciate the way automobiles, some real estate, and even jewelry do. It largely retains its value and banks and lenders feel secure when they hold gold as collateral. Gold also has tremendous appeal to investors. During some of the worst financial times in history when stocks have dropped, gold increased. Because gold has a history of holding its value, in many cases rising when the value of paper investments decline, there is little doubt it will maintain its popularity with investors and as a source of collateral with financial institutions. Purchasing gold is one thing, safely securing it is something else and oftentimes, not enough forethought is put into this latter part. It’s important that you ensure your gold is housed in a secure location. A reputable gold loan program provides safe and secure storage of your gold assets. Many gold investors pay an annual fee to store their gold assets at third-party facilities. 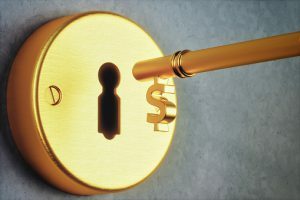 When you participate in a gold loan program, they are tasked with the responsibility of keeping your gold safe. It’s important to find a stable, reputable, and trustworthy financial institution when considering a gold loan program. Caye International Bank in Belize is such a bank. Caye Bank offers a gold loan program that safely allows you to borrow against the value of your stored gold. With your gold safely secured in a vault in Zurich, Switzerland, you can borrow up to 75 percent of the market value for your gold. In the unlikely event that your loan becomes worth more than 85 percent of the value of your stored gold, you can supply additional capital, or your gold can be sold to cover the difference. Participation in the program is simple and the risk is minimal. To be eligible for the program you must be a Caye International Bank client and account holder and have a minimum initial holding of USD $100,000 of gold. If you’re new to investing in gold, we will help you source, purchase, and store gold at or below market value. The costs involved with the gold loan program are minimal to the borrower. Annual interest rates hover at 5.7 percent for a line of credit against the value of your stored gold. If you take out a loan worth more than 50 percent of the market value of your stored gold, then your storage fees for the vault in Zurich will be free. The gold loan program is one of many services offered through Caye International Bank. Contact us today for more information about the gold loan program or offshore banking opportunities and advantages. This entry was posted on Wednesday, May 16th, 2018 at 12:46 pm	and is filed under Gold Loan. You can follow any responses to this entry through the RSS 2.0 feed. You can leave a response, or trackback from your own site.